Take a seat, sip some camomile tea, get cosy under a blanket. It's time to look at some oracle cards. I'm challenging myself to make a new game every month during 2019. This month I've returned to Construct 2. It's probably been my biggest project in ages. I'm very happy with how the cards came out, I can really feel my art skills improving a bunch. There are a few things I would have loved to include but I was butting up against the restrictions of the free version of Construct 2. Next month I'm going to learn how to use GameMaker, which should be fun! 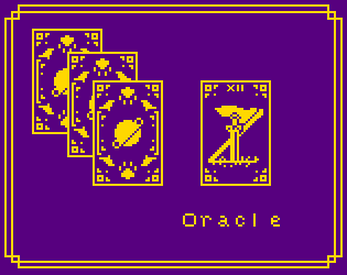 Oracle decks are custom divination cards that come in many different forms. I decided to think about what symbols, metaphors and objects have importance to me. I drew inspiration from many sources when compiling the 32 cards that make up this little deck. I hope you enjoy the little collection of musings and that you take the cards in the spirit they are intended - a bit of self-reflective fun.